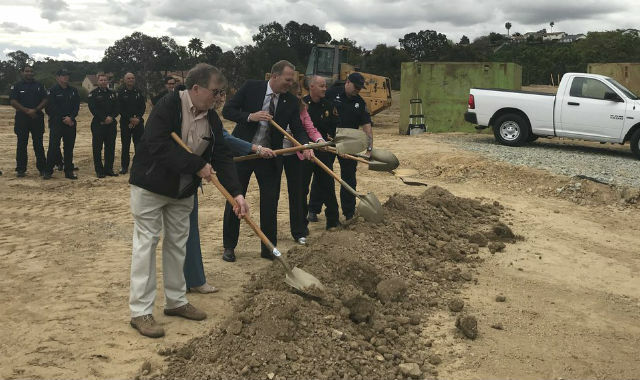 City officials broke ground Thursday on a fire station in University City, the 10th station the city has built or repaired since Mayor Kevin Faulconer took office in 2014. Once open, Fire Station No. 50 will be the eighth facility in the Fire- Rescue Department’s Battalion 5. The battalion responded to 998 fires, 585 rescues and roughly 11,000 medical aid calls last year, according to the city. San Diego Fire-Rescue Chief Colin Stowell attended the ceremony with Faulconer. The 12,000-square-foot, three-story facility includes a training room, a kitchen, three fire truck bays and sleeping quarters that can accommodate 10 firefighters. Faulconer said that under his watch, the city’s funding for infrastructure improvements and repairs has increased from $179 million in fiscal year 2014 to $559 million in the ongoing fiscal year. The city has opened fire stations in City Heights, Little Italy, Mission Valley, Point Loma and Hillcrest and has revamped stations in La Jolla, Mira Mesa, North Park and Southcrest. The fire station is expected to open some time next year.